In the early days of the invasion scare, during the spring of 1940, road blocks tended to be an eclectic mix of anything that came to hand from wires strung across roads, felled trees, carts filled with bricks or stone, barbed wire 'knife rests' and so on - but all this was to rapidly change. The Ministry of War Transport held the overall responsibility for providing blocks but the siting of all road and rail blocks was the responsibility of the Royal Engineers as was their construction, albeit by civilian contractors under RE supervision. The day to day setting up and manning of movable blocks was the responsibility of other arms and, in the case of Yeovil, the Home Guard. I strongly suspect that a myriad of improvised road blocks sprung up across the countryside where the blocks were frequently used as checkpoints since, apart from the threat of invasion, the main scares were German paratroops and Fifth Columnists. Identity checks were carried out at road blocks with great frequency, much to the annoyance of the public, and several cases were reported of civilians being shot by over-zealous Home Guard (Fleming, 1957). In the early days of the war improvised road blocks were the norm, such as that at Creech St Michael where, in July 1940, road block N.RD.10 consisted of two old cars filled to the brim with concrete and ready to be dragged to block the road at the old aqueduct. Alas the weight of concrete caused the wheels of both vehicles to collapse, rendering them useless and by November 1940 the cars had been replaced. Since the day-to-day life of the country had to continue, despite the very real threat of invasion, it was necessary to keep roads and railways open. Generally speaking the obstacles that made up the various types of blocks were stored at the side of the road/railway and any sockets in the road surface were covered with concrete or metal covers so that normal traffic was not inhibited. In case of an emergency, the majority of road blocks could be re-assembled in something like half an hour. All road blocks in Yeovil were manned by the Home Guard and the troops manning a block were expected to practice opening and closing the block on a regular basis. A Home Guard document in the Somerset Heritage Centre lists the tools issued to the team of 6 men who would be detailed for "Felling a large tree as road block, erecting wire, etc." as 1 cross-cut saw, 1 hand saw, 1 large rope, 2 large axes and 2 bill hooks. Similarly tools issued to a work party of 6 men detailed for "Digging slit trenches" was 3 picks and 3 shovels. Road blocks were invariably sited at vulnerable places on roads. Military Training Pamphlet No 30 stated that road blocks should be located in defiles, so that deviation from the blocked route would be difficult if not impossible, and should be sited in order to achieve surprise, such as just after a bend in the road. Blocks were preferably to be screened with hessian or other non-transparent material, usually slung across the road on ropes, etc. but high enough to prevent a tank from seeing over it. This, it was hoped, would either force the tank to halt so that it could be attacked, force it to drive off the road which would slow it down or else the hessian might snag on the tank and, hopefully, obscure vision from within. The manual stressed that road blocks must be kept under constant observation and fire from slit trenches or associated pillboxes. In Yeovil's case only two pillboxes were associated with road blocks and these had been constructed in the summer of 1940, at County Bridge and at the junction of the Yeovil - Dorchester Road. As well as pillboxes both road blocks and rail blocks tended to be associated with other defensive obstacles. 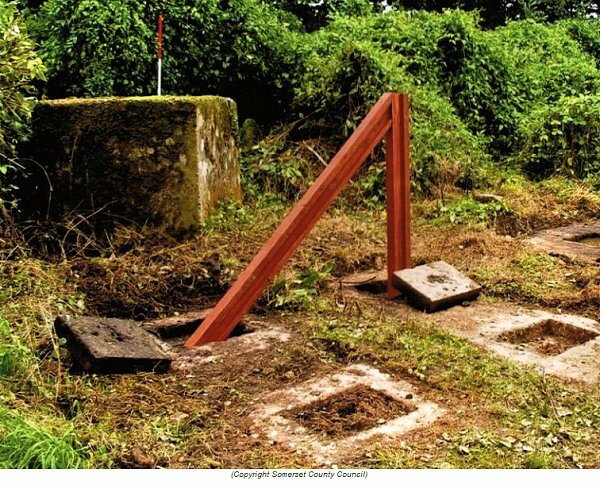 The block would span the width of the road or railway and might be flanked by one or more anti-tank cubes to close any gaps between the block itself and any associated obstacles such as anti-tank ditches. Blocks might also be reinforced with concrete cylinders, tetrahedra or even mines - see below. As the concept of anti-tank islands was initiated in 1941, all defence obstacles around the islands were inevitably pierced by roads or railway lines. There was little merit having a good obstacle if roads or railways cutting through it were not incorporated into the defences since tanks will invariably travel along roads in preference to travelling cross country and, because a railway line is as good as a road for navigating a tank, the same problem occurred with these. 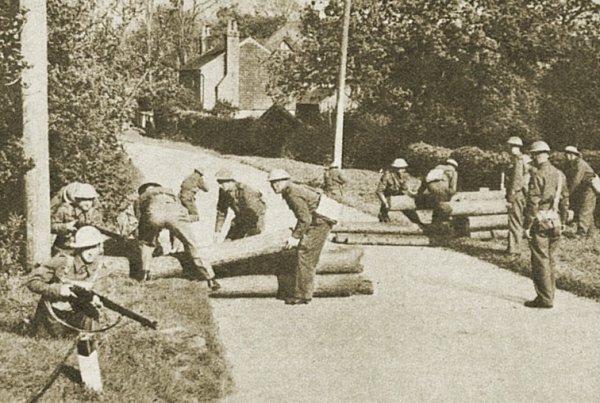 The Yeovil Home Guard set up a myriad of road blocks from the earliest days of the war and the Yeovil Anti-Tank Island, formed in 1941, comprised initially fourteen roadblocks, expanding to at least twenty-six road blocks by 1942. Some were classed as 'Outer' blocks and some classed as 'Inner'. It is almost certain that some of these would have been on the railway tracks, technically known as rail blocks, since a tank could use the railway track-bed as easily as a road. Secret Orders dated 15 January 1941, now in Yeovil library, stated "In the event of an invasion of this country, Yeovil will form an Anti-Tank Island which will be defended by the 208th L.A.A. T.R. R.A. and the Yeovil Borough Company Home Guard, which latter will for this purpose be detached from the No 3 (Yeovil) Battalion Somerset Home Guard and come directly under the orders of the O.C. Yeovil Anti-Tank Island Garrison. Yeovil Anti-Tank Island is defended by an outer and inner circle of road blocks and the Yeovil Borough Company Home Guard will be responsible for the defense of Zone 1 which consists of the following -"
Huish (near the junction with West Street) A 'bent rail' block - see photos below. It was noted "In the defence of these posts every effort will be made to hold up and delay the passage of all tanks and other vehicles belonging to the enemy." County Bridge over River Yeo - Garrisoned by No 1 Platoon and two sections of No 2 Platoon. The defences at this location included a Type 24 pillbox. Near junction of Crewkerne Road & Dorchester Road (Outer Road Block) - Classed as a 'Defended Locality' the defences at this location included a Type 24 pillbox and was manned by No 3 Platoon. A sufficient stock of picks, shovels and crowbars to allow a distribution of two picks, two shovels and two crowbars for each road block were to be stored at each Platoon HQ. Other items to be issued from a central location (the QM Stores at the Territorial Drill Hall, Southville) included bombs, anti-tank mines, wire, sandbags, Northover mortars and other stores. The fact that picks, shovels and crowbars were allocated to each road block suggests that the blocks were possibly often simply temporary measures. An early improvised road block (not in Yeovil) - checkpoints like these were a problem for the locals but little deterrent to a tank (Picture Post). Nevertheless other types of road and rail blocks may have been used in the Yeovil area and are discussed below. If anyone has further information on Yeovil's road blocks, please contact me. Anti-Tank Cylinders were large diameter concrete pipes or old oil drums that were filled with concrete. The tops were either flat or rounded into a domed form. They were usually employed at road blocks where they would be stored at the side of the road and then manhandled across the road when needed. 'Textbook' concrete cylinders were supposed to be two feet (600mm) in diameter and produced in two heights - 30" and 36" (760mm and 915mm) - weighing approximately 10 to 12 cwt (500 to 600 kg) respectively, although naturally there were variations depending on local availability of materials, etc. They were to be placed in groups of three with a tall cylinder facing the direction of the enemy advance and two shorter cylinders behind. Groups were to be spaced in at least three, preferably four, rows. Brick rubble or stones were to be scattered around the cylinders to ensure they didn't roll away if knocked over by a tank. Day to day setting up and manning of cylinder road blocks was the responsibility of the Home Guard. Each cylinder required four men to handle it and eight men could place the 27 cylinders required to block a 30-foot (9m) gap in 20 minutes. The horizontal rail type block consisted of two large reinforced concrete blocks, permanently sited one each side of the road/railway. Each block had a slot to take horizontal railway rails or rolled steel joists (RSJs); one slot would be closed at the top to secure the rails while the other block was open at the top to allow the rails to be slotted in. The rails would then be secured with a ½" (12mm) steel pin passing through holes in the concrete block towards the top such that the pin sealed the slot above the rails. The pin was threaded at both ends and each end was secured by a washer and nut. This would have allowed for a relatively easy removal under normal circumstances, but would have been somewhat more difficult for an enemy infantryman to disassemble under fire. Horizontal rail type blocks were usually sited across railway tracks but, since Yeovil's railway infrastructure has mostly disappeared, it is now not possible to tell if any were used locally. An open-top slot horizontal rail block (left) and its closed-top slot companion. Two lengths of railway track would be lifted into the slots and locked in by a long bolt. The vertical rail type road block, commonly called the "hedgehog", employed a series of 90-lb rails or heavy section RSJs, erected vertically into concrete sockets with the flanges facing the enemy's line of advance. This type of block was usually used at road blocks rather than rail blocks. Spacing between rails across the line of approach was 4 feet (1.22 m) with alternate rows staggered and the distance between rows was 5 feet (1.53 m). With each rail being a two-man load, the rails required to close the gap shown below would take six men about 25 minutes. 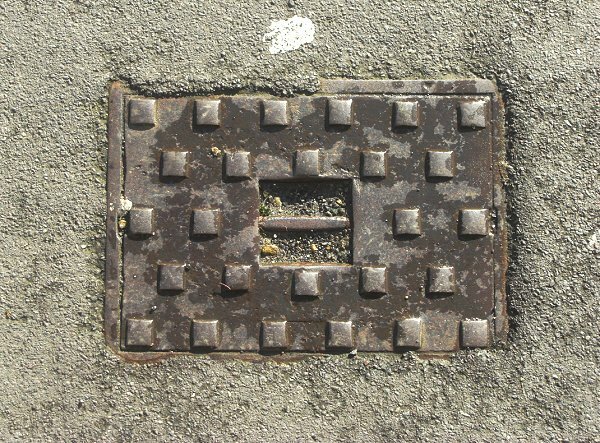 'Text book' concrete sockets would have been 5' 6" (1.68 m) deep and 2 feet (600mm) square with the socket lined with a minimum of 1" (25mm) timber and the length of rail within the socket being 4' 6" (1.37 m). If RSJs were being used the timber could be omitted from the socket since RSJs are less brittle that 90-lb rails. Again, it is not known if any of Yeovil's blocks were of the vertical rail type. The bent rails were set out in at least four rows with the obstacle being designed "... to provide a sloping arm heading up to the peak of a vertical member which will force the tank to climb up and belly on the peak." (War Office, 1940). It was anticipated that 90-lb rails would be used or, if unobtainable, rolled steel joists of a minimum 8" x 6" (200 x 150 mm) section could be employed with similar layout and spacing to those of the 90-lb rails shown in the diagram at left. As with the vertical rail type of block, if RSJs were being used the timber could be omitted from the socket since RSJs are less brittle than 90-lb rails, however the Military Training Pamphlet helpfully noted "RSJs are bent more easily than rails by charging tanks." 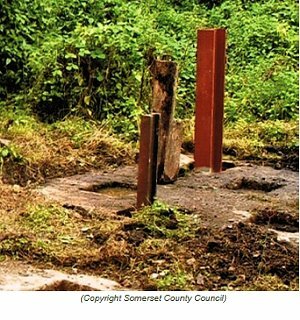 Certainly one is known to have been in use at the road block on the corner of Beer Street and West Hendford and another in Huish near the junction with West Street (see photos below). A replica "Hairpin" road block fabricated for an Open Day at Dillington House in 2008. The original road block, T.RD.18 in the south drive of Dillington House, was part of the Ilminster Anti-Tank Island defences. 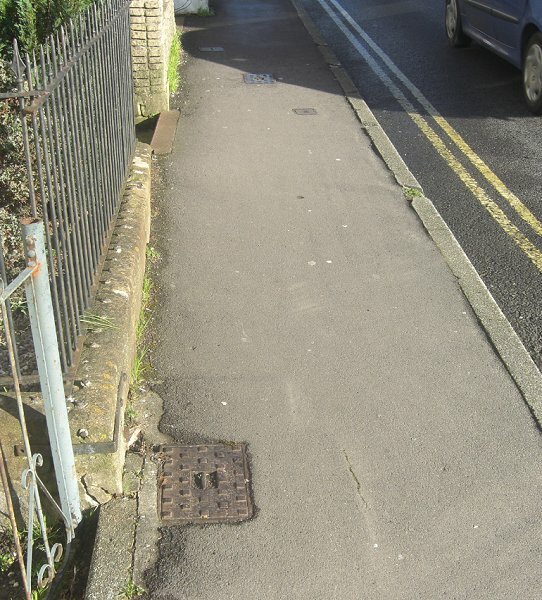 Note the concrete socket covers with steel handles which, when in place, would allow free access through the road block. 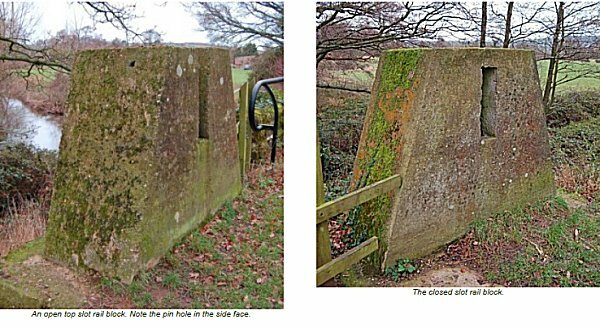 Note also the reinforced concrete anti-tank cube - these were often used to close any gaps between a road block and other obstacles such as an anti-tank ditch. Also, as with vertical rail type road blocks above, if the block was sited on a road the rails may have been thoughtfully painted with a couple of broad white stripes, or blackout markings, to prevent traffic or pedestrians colliding with them after dark. Remnants of the Inner Road Block No 3 of 1941 in Huish, near the junction with West Street (many thanks to Tony Robins for telling me about it). The two metal covers, one in the foreground and the second just in the shadow of the passing car, are the sole remnants of the Yeovil Anti-Tank Island. The covers were part of a 'hairpin' road block. Photographed in 2014. The western of the two road block covers. Photographed in 2014. .... and the eastern cover. Photographed in 2014. Anti-Tank Mines are known to have been employed at road/rail blocks in Yeovil. Anti-tank mines were often used in conjunction with road blocks, for example at Weycroft a typical road block S.RD.54 is recorded as being supported by 12 tetrahedra and 12 mines while road block S.RD.56 had 18 tetrahedra and 18 mines. It is usually not clear how the mines were used, the easiest method being to simply lay mines on the road in an emergency with them probably normally being stored in their crates at roadside or in a convenient pillbox. 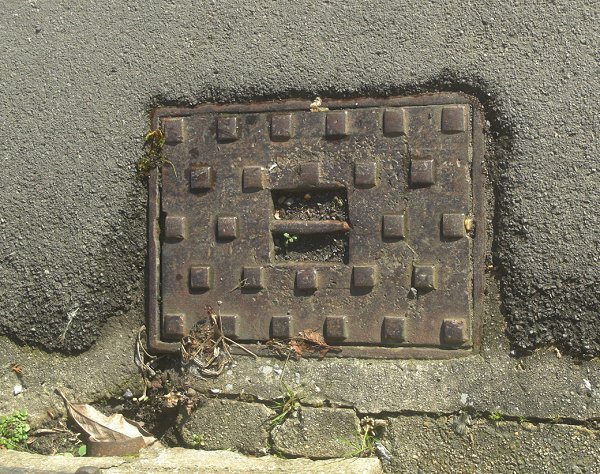 However it is known that a large number of mines were set in holes in Somerset's road as recalled by Eric Westman - "The road was prepared for spider mines by boring 7" diameter holes in the road and fitting them with metal lids. In the event of any imminent attack the holes would be charged with mines. I remember some 10,000 holes had been drilled in the roads of Somerset to accept these mines. Sadly the holes were drilled for Mk I mines which, by the time the holes had been drilled, had been superseded by Mk II which were larger and therefore would not operate in the Mk I hole!" (Eric Westman, quoted in Wilson, 2004). Large numbers of small anti-tank obstacles - commonly known as "Dragon's Teeth" or "Pimples" - were employed across the country. Tetrahedra, as the name implies, were pyramid shaped reinforced concrete blocks composed of four triangular faces, three of which meet at each vertex and the fourth forms the base. They ranged in size across the country, but were typically 2 feet (61 cm) high. They were often made with steel hooks or rings attached which would aid lifting and also make a suitable anchorage for barbed wire. They were designed primarily to counter tanks and other armoured fighting vehicles which, attempting to pass them, would climb up exposing vulnerable underparts and possibly get tracks or wheels caught between the points. They were frequently used as a part of road blocks where they could be stored at the roadside and manhandled across the road when needed. Tetrahedra could be stored at the roadside and manhandled across the road to reinforce the roadblock when needed. 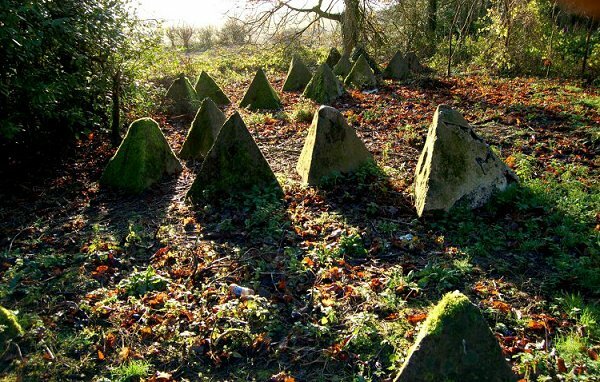 These tetrahedra were part of the Ilminster Anti-Tank Island defences. If anyone has first-hand information on Yeovil's road blocks, please contact me.